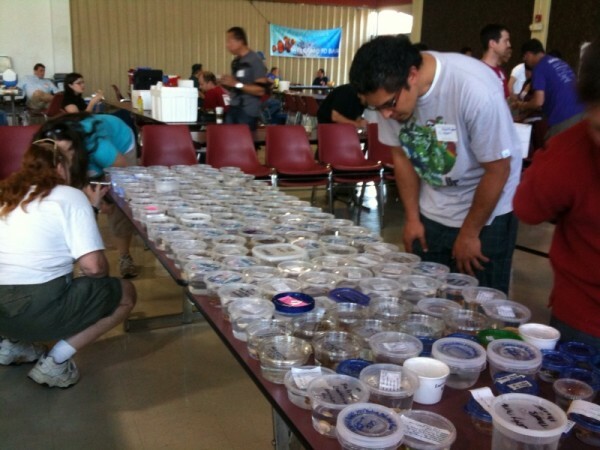 I have been fortunate to attend several frag events around the country this year, but none gets me as excited as the Bay Area Reefers (BAR) regional fragswap. Last weekend there were no guest speakers, no vendor booths, and best of all, no money changing hands for corals. There is a small entry fee to help pay for the infrastructure, and each participant is required to bring at least 3 frags of differentÂ strains. The format is an actual ‘swap’ where people bring corals in deli containers (they don’t leak, you can see through them, and they are reusable), check in, and the frags are then grouped by type on tables in picking area. There are 10 picking groups of about 10 people each, numbered, a-j, to which participants are randomly assigned. When the picking begins, groups are allowed into the picking area for 2 minutes and are allowed to pick one frag from the tables. After about 3 or 4 times through all the picking groups, the number of frags goes up to speed things along. and other cool stuff available through the first couple times through all the picking groups. There is even a list of corals that don’t go into the event proper, but onto a free table, because they are too common. Sponsors donate frags and the club even has a prop program to help fill out the tables. All in all, there were about 100 people at the event and over 600 frags. Super awesome, and I cant wait until the next swap in February.